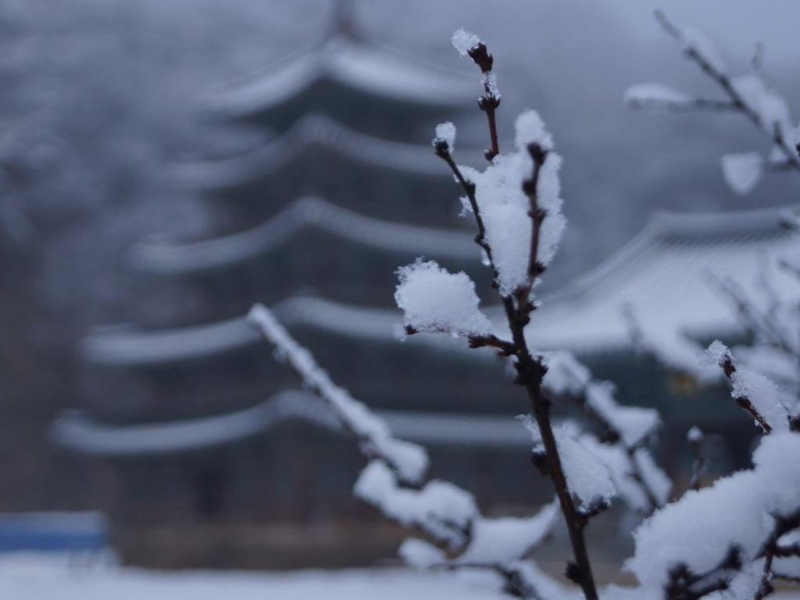 BeopjusaBeopjusa Templestay is a unique opportunity to experience a temple life and atmosphere of 1700 year old buddhist tradition in Korea. You can find easily the stillness inside, while being surrounded by the dharma of the Buddha and by a beautiful nature consisting of mountain peaks, streams, forests and lakes. Beopjusa Buddhist Temple is surrounded by an abundance of beautiful nature, in the national park mountain Songnisan. Beopjusa literally means "a temple(SA)" where "the teaching of the Buddha(BEOP)" "resides(JU)". 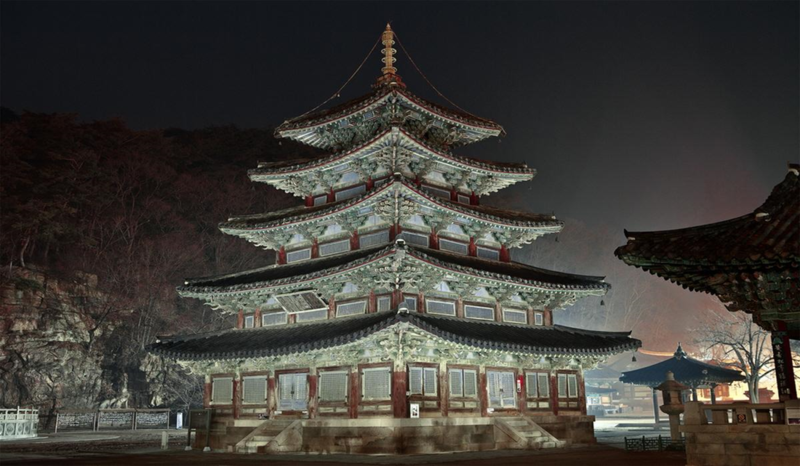 Founded in 553 CE, the ancient space cherishes innumerable cultural treasures, which will give you access to the essence of both Buddhist and Korean traditional culture, bringing both local and foreign visitors together. The humble, but pristine and gorgeous temple welcomes everyone with its wide-open doors. Beopjusa is especially well-known for its cultural properties. The temple highlights are Geumdongmireukdaebul (gilded bronze Buddha statue 33 meters or over 100 feet high), Palsangjeon (five-story wooden pagoda), Daeungbojeon (considered one of three major Buddhist halls in Korea), Ssangsajaseokdeung (twin-lion stone lamp), Lotus-Shaped Stone Fountain and Palsangjeon Hall. 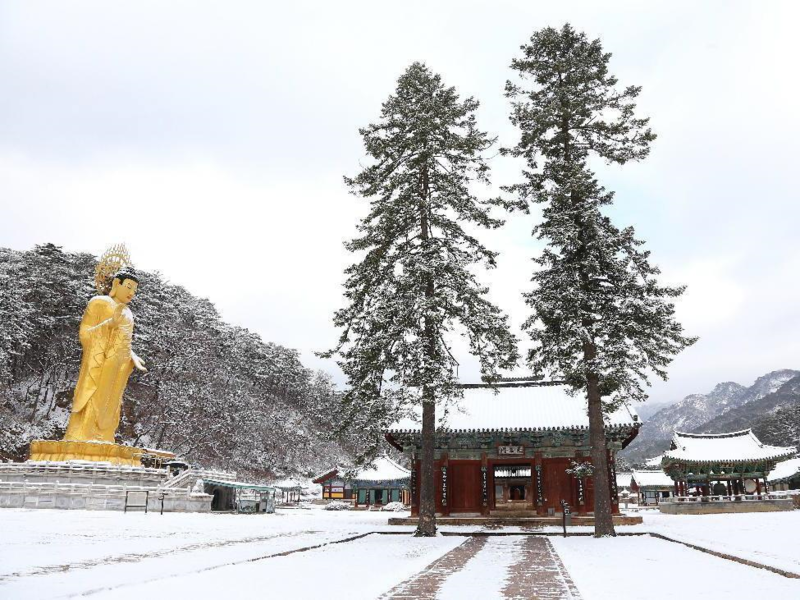 In modern years, Beopjusa has taken a leading role in providing a systematically structured Temple Stay program to meet the needs of modern Buddhists in and out of Korean peninsula. 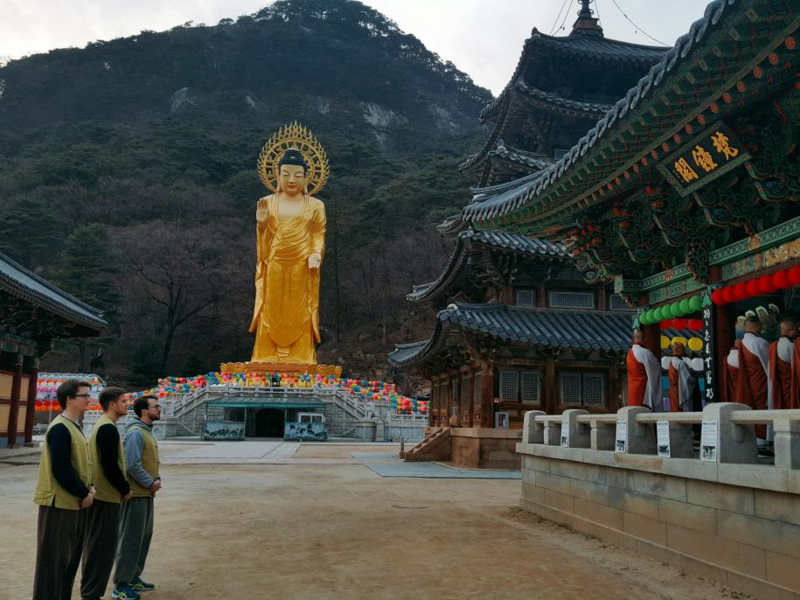 The well-organized Temple Stay program is a great way to experience the traditional Korean Buddhism even for those who are new to the culture. Regardless of one’s religion, Temple Stay is a program where one can stay in a traditional Buddhist temple to experience the spiritual culture and practice of Buddhism. It is open to everyone who wants to get away from their busy and complicated lives, be part of nature and turn inwards to self-reflection. The program includes early morning chant with the monks under the moonlight and stars, Zen meditation, meditation in the mountains and tea ceremony with the monk. The doors of Beopjusa will always remain open for the seekers of the true happiness.